This posting is a quick and easy way for readers to submit their own articles or opinions. Just add the article in the comments box and the moderator will publish it after it has been checked as not spam. The AASR ritual prescribes that during the initiation’s ceremony the profane takes an oath on the Libations’ Cup. In ancient times, libation was a sacrifice consisting of a pouring out of wine or other liquid in honour of a deity. Man used recipients of a particular shape. Freemasonry maintained such a peculiarity. In West, Graal is the most famous cup. The root word is uncertain, some people think it is an old French word stemming from Latin gradalis, which means “plate”; for others it derives from ancient Greek kratér, pot. Graal gave birth to many legends, the most famous being those of the Arthurian cycle; however Christian legends overlapped Celtic and Gothic ones. 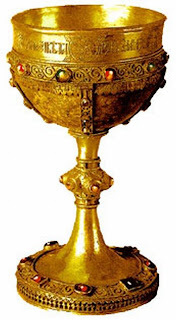 According to a Christian legend, the Graal is the cup which Joseph of Arimatea collected some drops of Jesus’s blood. The Graal then becomes “Holy Grail” andHoly Grail symbol of heart. Such a symbol is however far older. In Egyptian hieroglyphs a pot meant the human heart. We know that analogy is the means to decrypt the symbolic language, so no wonder that the containing thing is used to point at what is therein contained and vice versa. Heart is the being’s vital centre; in astrology it matches the Sun, centre of the universe. We can therefore infer that Libations’ Cup is symbol of the profane’s heart, which receives Initiation’s gifts. It could appear quite weird that brain is not their final destination, but this is due to the peculiar esoteric teaching, which has to be internalized, rather than understood. In conclusion, drinking out of the Cup the profane makes a sacrifice, offering his heart to Tradition.